I now understand what I need to do and, more importantly, why. I know how to work out the score without using the "official" ready reckoner grids. I have produced a couple of sheets that will speed things up for me. Preparing the sheets has really hammered home how to calculate the scores. 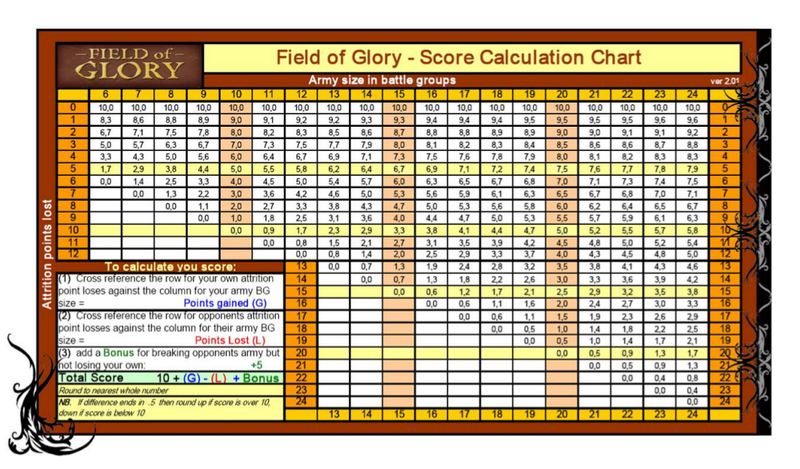 Sheet #1 is a score card for up to three games which has the advantage of reminding me to record the army size and losses for both sides as well as leading me through the calculations. Sheet #2 is a full score ready reckoner which has the advantage of requiring nothing other than lookups, one simple addition and one subtraction. It's worth noting that Sheet #2 contains not one but two lookup grids. Despite my reservations about the double use of the single grid in the "official" ready reckoner I wanted to experiment with two simple look up tables: one for my losses and one for my opponent's losses (the calculations aren't the same). I understand why the"official" one is as it is (compactness & brevity) but I wanted to avoid complex post lookup instructions (like lookup losses, subtract from 10 to work out your gains). As I've not had the opportunity to use either of them, I'm not sure which will I prefer. I've a sneaking suspicion that I may even end up using both: Sheet #2 to calculate the results and Sheet#1 to record the scores. I've got three games in a day next Sunday as part of the Stoke Challenge (UK) so I'll report back after field testing them. In the meantime feel free to download and use the sheets. Any feedback is more than welcome. You do great work, Martin. I'm printing this! Great! Which one do you prefer?